This bike has under 14000 miles on it and has been totally rebuilt using products that we stock and sell. The Frame, Swinging Arm, Side Stand, Front Mudguard Brackets, Rear Mudguard Brackets and all other brackets are Powder-Coated in Gulf Orange. The Wheels, Foot Peg Hangers and Fork Tubes are all Powder-Coated Gulf Orange. 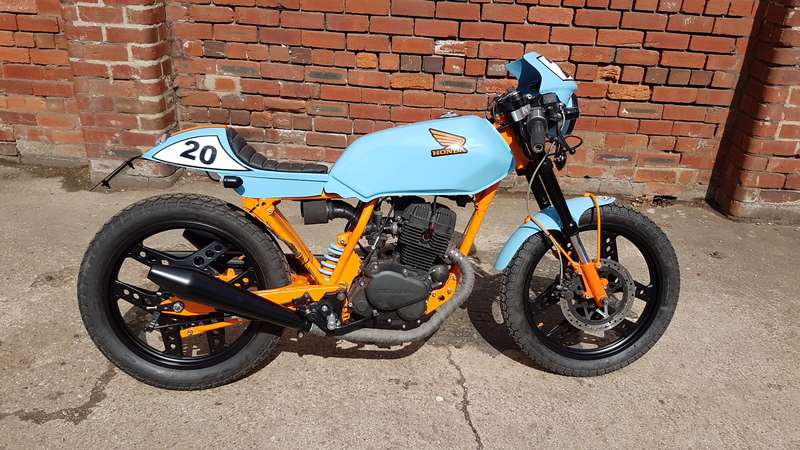 The Tank, Mudguard, Headlight Bowl and Seat are all painted Gulf baby Blue with Orange decals painted on. As you can see this is a very good looking bike that rides well as good as it looks and draws a crowd in everywhere it goes. We are currently in the process of putting a few miles on this bike and has been excellent fun for Tony. V5 logbook is available and it also has 12 months MOT. Please note we can only take cash upon collection for this bike.